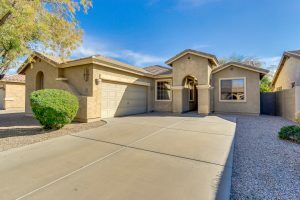 2,353 SQ FT IN CHANDLER’S CLEMENTE RANCH WITH POOL! Move-in ready 2,353 Sq Ft, 4 bedroom plus den, 2 bathroom home in Chandler’s popular Clemente Ranch at Dobson & Germann. Spacious well kept great room floor plan with separate dining & living rooms, custom neutral paint through, arched doorways, and beautiful tile & carpet flooring. Bright island kitchen with stainless steel appliances, breakfast bar, big pantry, and ample counter space & cabinets. Gorgeous master suite features huge walk-in closet, dual sinks, separate walk-in shower & soaking tub, and water closet. There’s also an enclosed patio, sparkling pebble-tech pool with water feature, pavered sitting area, low maintenance landscaping, R/V gate, and 2 car garage with service door to the backyard. In wonderful community full of amenities including acres of parks, basketball, volleyball, shaded tot lots, ramadas, biking/walking paths, neighborhood schools, and more. Great location close to freeway access, Intel, Chandler Fashion Center, golfing, and many other entertainment options.